It’s very difficult for our students (at least for the beginners) to tell the difference between “a ver” and “haber”, probably because we pronounce both exactly the same. Do you understand the difference between these two sentences: “Vamos A VER cómo acaba el partido de fútbol” and “Tenías que HABER llamado a tu madre; estará preocupada”? No clue? Don’t worry! In this post we’ll try to explain the differences between these two words. When asking a question to someone, is used to ask to this person if he/she lets us see or check something:- Mira lo que acabo de encontrar en la calle —¿A ver? (- Look what I just found in the street – Let me see). Expectation or interest to know something. Is usually followed by an indirect interrogative: A ver cuándo podemos quedar (Let’s see when we can meet). Used to catch the attention of someone before asking or telling him/her to do something: – A ver, trae mi bolso (Hey you, bring my bag). Means “what else can I do?” when you are talking about something that is inevitable: – Al final, ¿te mudas a Sevilla? – ¡A ver! Si no lo hago, me despiden (- Do you eventually move to Seville? – What else can I do? If I don’t do it, they fire me). Means expectation, curiosity or interest. Is followed by the conjunction “if”(si): – ¡A ver si nadas más rápido que yo! (Let’s see if you swim faster than me!). Let’s see, what do we have here? = (Vamos) a ver, ¿qué tenemos aquí? We will see where the money comes from = Vamos a ver de dónde viene el dinero. You will see that a national healthcare system is not an impossible goal = Vas a ver que un sistema nacional de salud no es un objetivo imposible. Let’s see how we can fix it = A ver cómo podemos arreglarlo. Let’s see if we can do it better = Vamos a ver si lo podemos hacer mejor. 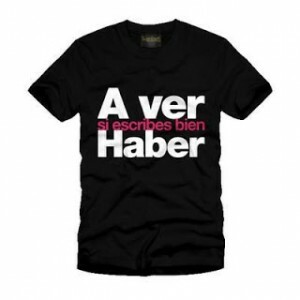 The Spanish verb “haber” means in English “to have” and also “there is/are/was/were…”. It depends on the context. “Haber” can be either a verb or a noun. As a verb we use it as auxiliar, followed by a participle: Haber venido más temprano (You should have come earlier). Infinitive of an impersonal verb: Parece haber una mujer en casa (It seems like there is a woman at home). Means someone’s possessions: Su haber era escaso hace cinco años (Her/His possessions were very limited five years ago). Since there was no lifeguard, I didn’t go to the swimming pool = Al no haber socorrista, no fui a la piscina. Who is responsible for bringing this? = ¿Quién es el responsable de haber traído esto? Are you glad you’ve come? = ¿Te alegras de haber venido? If you are still confused about these two words, we can help you with this and with other doubt’s regarding Spanish grammar. You just have to ask us for a trial class. It takes 20 minutes and is free!